View Tom Dempsey's Slovenia photo collection Part 2: In Skocjan Caves (Skocjanske jame) Regional Park, Slovenia, experience a river raging through one of the world's largest caverns, plus admire some speleothems (cave formations, dripstone: stalactites, stalagmites). An impressive forest of stalactites clings to the ceiling of Schmidt Hall (Schmidlova dvorana), the natural cave entrance which emerges into the collapsed Velika Dolina (Big Doline, a sinkhole). Humans actually lived in adjacent Tominceva Cave (Ozka spilja) from 3000 BC to 1700 BC. Modern tourism began by 1819 AD. Don't miss the wonderful cave tour Part 2, a self-guided walk which follows the mysterious Reka River from Mala Dolina (Small Doline) through Mahorcic Cave (Mahorciceva jama) upstream underground for 350 meters over exciting bridges and dimly lit passages. 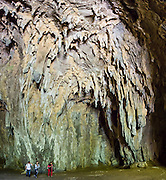 UNESCO has listed Skocjan Caves as a World Heritage Site. From a large-scale karst drainage, the Reka River has carved and dissolved dramatic subterranean passages through limestone over several million years. Karst topography is a geologic formation of dissolving bedrock. Our word for "karst" likely evolved from the Slovene noun kras and earlier proper noun Grast, referring to Slovenia's Karst Plateau. Skocjan Caves are near Divaca village, in the Littoral region of the Republic of Slovenia, Europe. Predjama Castle (Slovene: Predjamski grad or Grad Predjama, Italian: Castel Lueghi) is a Renaissance castle rebuilt in 1570 from a 1274 Gothic version within a cave mouth near Postojna in the historic region of Inner Carniola, south-central Slovenia.